Italy is well known for its beautiful lakes, here are my three favourites. Lake Iseo is located east of the city of Bergamo (a Ryanair hub) and to the west of the better known Lake Garda. I love Lake Iseo, it’s not so busy and touristy as the other lakes. It has an island, Monte Isola, the largest lake island in Europe, in the middle of the lake which is reached by regular ferries from several lakeside towns. Monte Isola is car free so ideal for walking and cycling. Iseo Town on the southern shore has a lakeside promenade, some great restaurants and is close to the Franciacorta sparkling wine region. The Sassabanek complex on the outskirts of Iseo town has tennis courts and three swimming pools. The town Lovere on the north western bank is home to the Accadenmia Tadini art gallery, created in the 1820 by Count Luigi Tadini in memory of his only son Faustino. To the north of the lake in Val Camino is the National Park of Rock Engravings where you can see prehistoric rock carvings. Lake Como is a good place to do some celebrity spotting as George Clooney, Richard Branson and Sting all have homes there. The lake has two legs, I stayed in Como town on the southern tip of the western leg. 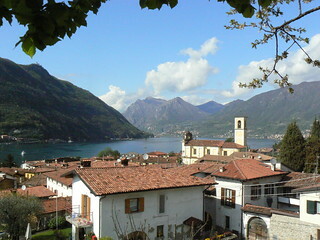 You get marvelous views of the town and lake if you take the funicular to the village of Brunate. The Como Silk Museum illustrates the history of the silk industry in the area. There’s a wide choice of boat trips from Como town, I went to the village of Bellagio at the fork of the two legs by hydrofoil. I didn’t manage to visit Villa Carlotta in Tremezzo, as it closes from mid November to mid March, but the house and gardens are highly recommended. Lake Trasimeno is located mid way between Florence and Rome. While not the most dramatic of Italian lakes, Trasimeno which borders Umbria and Tuscany , was a very pleasant water side stop when touring the area. Some of the best views are from the castle at Passignano sul Trasimeno. Another pretty town is Castliogne del Lago. I had a paddle in the lake which was pretty shallow even at 200 metres from the shore, but my husband went out further in order to swim. There are three small islands in the lake, only one of which, Isola Maggiore, is inhabited. Do you have a favourite Italian lake? Image Credits: livenature, pascobs, lorenzinhos, asterix. believe me or not, the best lake in Italy is the Orta Lake (and his pretty Isola di San Giulio in the middle), in Piemonte, not far from Lake Maggiore. 1h by car from Malpensa Airport. Oscar, I haven’t been to Lake Orta but have read that it’s very beautiful. Como’s good, but Garda gets my vote. Not been to the others yet. Jools I have been to Lake Garda but overall prefer Como.